Cyndie and I drove up to the lake last night. It was a long day in a car for her, because she started the day yesterday up at the lake. She had gone up on Wednesday with Melissa and daughters, in an original plan to have me drive up to join them Thursday night, but that changed when a memorial for Charlie Weller was announced for Friday. Charlie was the husband of Cyndie’s close high school friend, LuAnn (Miller). The revised plan had Cyndie riding home with Melissa and the girls yesterday afternoon, taking a moment to freshen up from beachwear to something more appropriate, driving us through afternoon traffic to Eden Prairie from our house, and then heading back to the lake from there, after paying our respects. LuAnn and Charlie were dating in high school, not long after Cyndie and I had begun our relationship, so my memories of Charlie are wrapped in fragments of events that I haven’t thought about in decades. Even driving on roads in Eden Prairie, now approaching only six years distant from when I drove them almost every day, was feeling a little fractured. I had to ask if we turned right or left at the intersection by the House of Kai restaurant to get to the funeral home. In our haste to pull off this plan, we left out one pertinent aspect of determining the optimal route back to northwestern Wisconsin. I was tempted to try the old way we always drove when our kids were little and we regularly made the trip on back roads, but construction and traffic made the city portion an unwanted annoyance. We paused for dinner at Jake’s to give traffic more time to thin out. In the end, we chose to skirt the metro area on 494 and head up toward Stillwater to cross into Wisconsin on the new bridge. The resulting country roads we picked provided a rich reward of light traffic, gorgeous rolling hills and spectacular scenery. 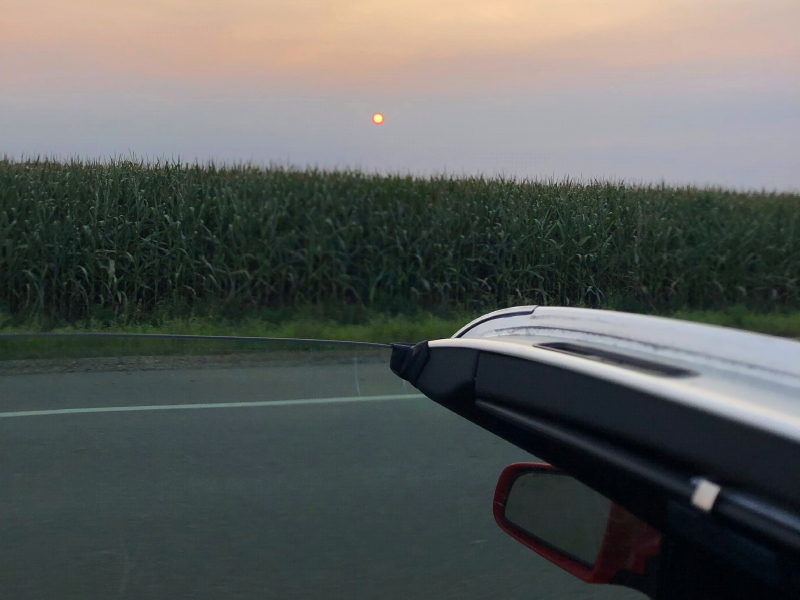 We chuckled over the MPR radio weather forecast of “partly smoky” from the many fires burning out west, but when changing stations to our old favorite WOJB as we got far enough north, we heard the same phrase used again. Maybe it is an actual authorized weather service term. It sure made an impact on the setting sun. It was looking dusky a lot earlier than the actual time of sunset. I held up my phone through the open top of Cyndie’s convertible at 7:52 p.m. and experimented with capturing it at 60 miles an hour. Then I tried zooming in. It looked like a cartoon drawing of the sun. The optics of my iPhone seem to have added special effects without my input. 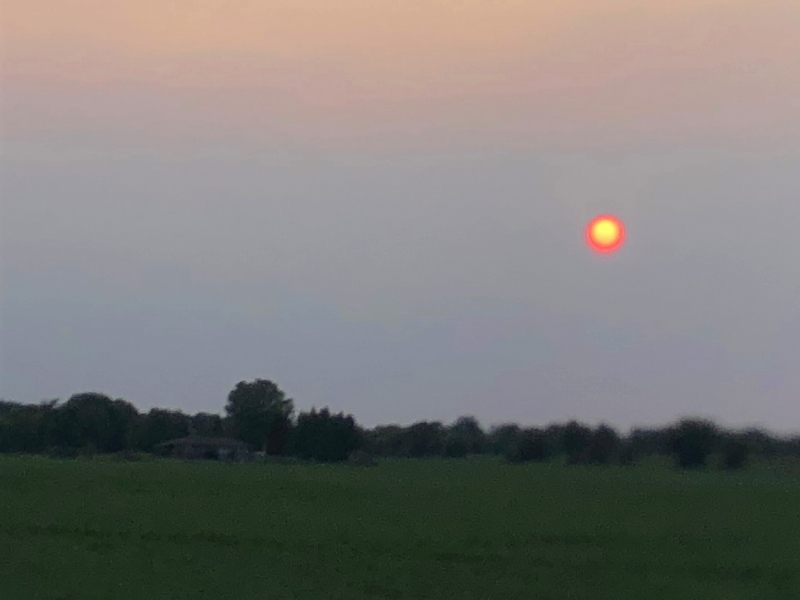 Yes, that’s the sun glowing through the smoky sky. 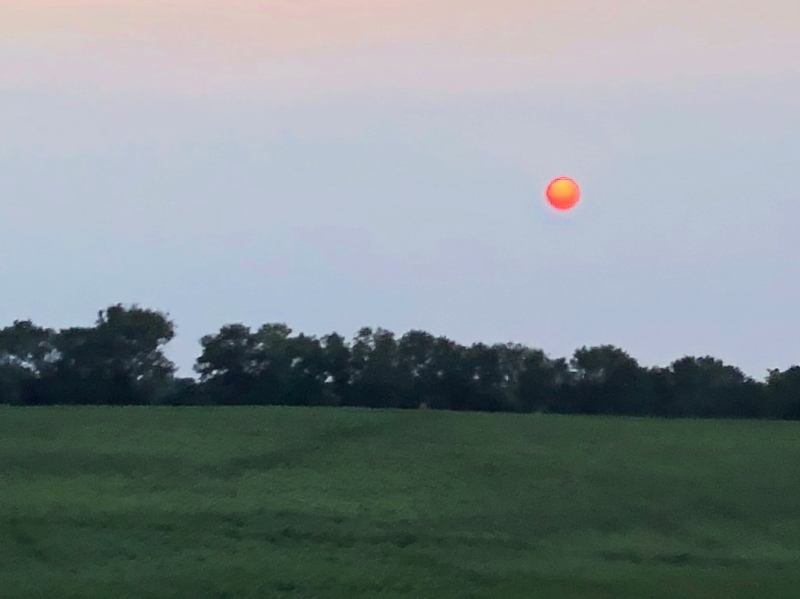 Between the funky looking sun, my grasping at recollections of interactions with LuAnn and Charlie back in the 1970s, and finally, unexpectedly stumbling upon a portion of our old back roads route, but from a different point, my mind was feeling partly smoky. And now we are up at the lake again this weekend.